Look like a dreamy watercolour painting come to life in the Shapes Dress by Gorman! 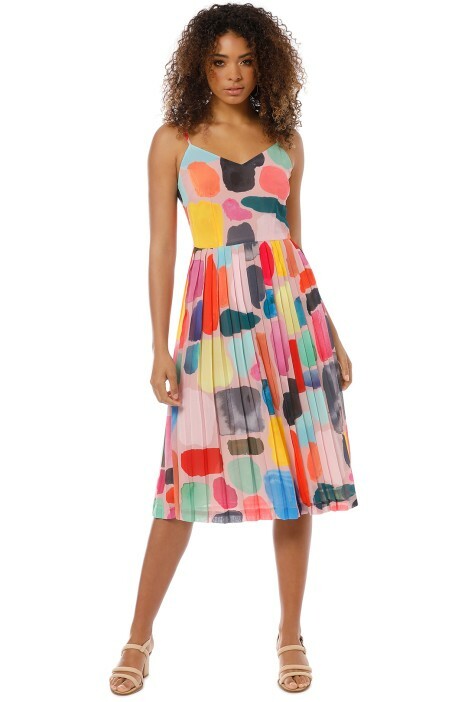 Featuring an exclusive Gorman x Kindah Khalidy print, the stunning dress features a sweetheart v-neckline and thin shoulder straps. The midi skirt has permanent pleats and finishes just below the knee. Playful and feminine, hire it for an upcoming daytime function or garden wedding. Make a vibrant statement at your next garden wedding by styling the dress with ankle strap wedges and rent a raffia pod clutch to complete. Check out our blog for tips on what to wear for outdoor weddings.